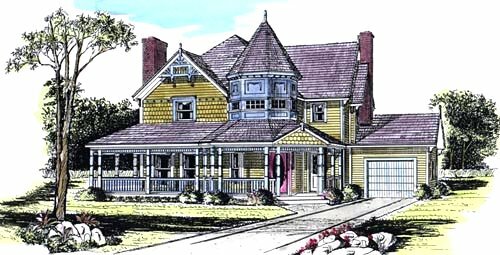 House Plan # 5190 - All the tower needs is a princess to complete the romantic charm of this decorative Victorian style. Spindle work ornamentation with delicate turned porch supports is included in the wraparound veranda. House Design # 5190 has a parlor, dining room, and kitchen with dinette, family room, four bedrooms, two baths and a foyer, totaling 2,205 square feet of habitable space. There is a mudroom, garage and lavatory. Sliding glass doors lead from the family room to a rear terrace. The overall dimensions of 53 feet, 8 inches by 37 feet, 10 inches include the garage. There is a full basement.